I am so happy today. I got a prize in the post and it is glorious! I won a prize in the Sew Mama, Sew Giveaway Day bonanza. I won it from Go Knit In Your Hat, which is the blog written by the dyer behind the Black Bunny Fibers brand, Carol J. Sulcoski. As this was an indie-dyer from the USA, I hadn't come across this brand before, but oh how I wish I had. This prize comprised of some sock yarn and a pattern. Here is the sock yarn. The yarn base is Superwash Merino Classic and the colourway is Delft. It is so hard to convey quite how deep this blue is. The photographs don't quite capture it. The photo below is probably the closest I was able to get. The yarn is super squishy and my fingers are itching to knit something with it. The yarn came with a printed pattern, on lovely thick paper. In fact, the paper was so thick it was almost card weight. The pattern was the Emmett Sock pattern by Carol J. Sulcoski. You can see a picture of the pattern on this post from Carol's blog. As this is a superwash I am tempted to knit the sock pattern in this yarn, as the socks would look beautiful. But I also think that I want that blue up round my face. It's a tough choice. Oh, I also got some chocolates that we don't really get here. Nom! Thank you Carol for your lovely prizes, I adore all of them. Now, back to our scheduled programme! I have two WIPs to share this week. I do have other WIPs but I haven't touched them, so there is no point in sharing. The first is my lovely spiral blanket. I've added a good couple of extra rounds on this baby since the last time I showed you. I took it away with me at the weekend and it has also been my knit club knitting. I don't know how long I'll be able to carry on with this blanket as it is starting to get rather warm under it. It may have to go on a holiday for a couple of months, during the warm weather. I now have 5 skeins of this yarn and I have used one and half of them, so I think it will be a reasonable sized lap blanket, which is what I want it for. The second project is a new one. I have had this project in my queue for a few months. I loved the pattern when I first saw it and kept coming back to it, time and time again. 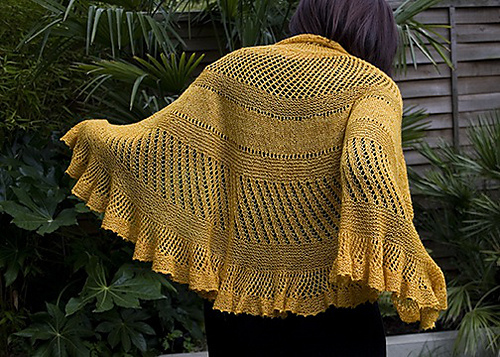 I was reminded of it when MinnieMoll knit her version of it, The Radiance Shawl by Helen Stewart. I loved everything about this shawl, the colour, the drape, the shape and the simple, but effective, lace stitches. Sometimes I think simple is more effective than complicated. The shawl is a semi-circle, which is a shape I like. Because I fell in love with the colour, when I saw this skein of yarn I bought it. Not bad for a couple of hour's effort. The pattern comes with three different layouts that you can print off. The normal full version, the printer friendly version with no pictures and the checklist version. The checklist version is the one I'm using. It makes it so easy to see how far you have come and has numbers of stitches listed and percentage completed in various columns. Its a great way of laying out a pattern like this. I really like how the sections of garter stitch give contrast to the stocking stitch sections. The shawl is already looking beautiful, which is hard to achieve before blocking. I like the spiralling ridges created by the very simple eyelet pattern. I think I'm going to enjoy every minute of this project. In fact don't be surprised if this is all you see for a few weeks! As usual I'm hooked up to Tami's WIP Wednesday linky party, which has some lovely bloggers taking part. I highly recommend a visit, by clicking the button below.